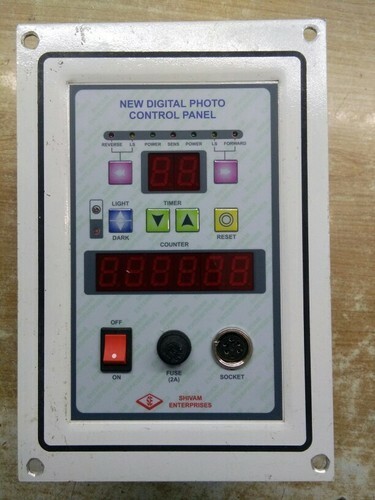 We are engaged in fulfilling the diverse requirements of clients by offering an optimum quality Digital Photo Electric Control Panel. The offered panel is used in numerous industrial and residential applications to control the electricity supply. Using the quality assured components and progressive techniques, this panel is manufactured under the guidance of deft engineers. Our provided panel is also tested on defined measures of quality to ensure its high functionality. Shivam Enterprises is a reliable and renowned manufacturer, trader and supplier of a supreme quality range of Multi Programmer Controller, Digital Electric Panel and Digital Load Cell Cutaway etc. Founded in the year 2013, we are a Sole Proprietorship Firm that is located at Faridabad (Haryana, India). To manufacture these electronic products in an efficient manner, we have developed a well functional and spacious infrastructural unit. This unit covers a wide area therefore divided into sub-divisions that include manufacturing, transportation, warehousing, procurement, sales, R&D, marketing, etc. Managed by our veteran and devoted team members, all the divisions are well resourced with the essential devices, tools, equipments and machinery. Additionally, we have gained the confidence of the clients due to our wide distribution network, ethical policies and crystal clear dealings.